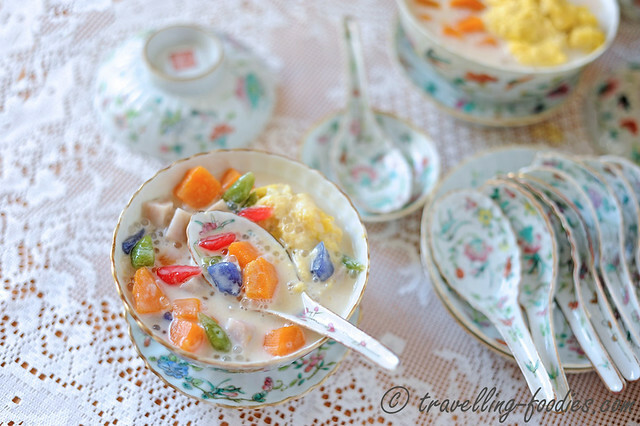 Bubur Cha Cha or “Bubor Cha Cheir” as it is known to some Peranakans, is a dessert soup which comes close to heart for my family. My mum loved it immensely and made it often enough for us to develop a liking for it as well since young. It is a chuchi mulot which she would exercise her creativity in the ingredients to be added depending on the amount of time she had at hand and of course what we loved to eat. Kept minimalistic, it would simply be just a sweet coconut milk broth base with diced kledek (sweet potato) and keladi (taro) cooked in it. More elaborated, an assortment of other “accessories” like bijik sagu kechik (small sago pearls), and legumes like kacang merah (red beans), kacang ijo (green beans) or kacang mata itam (black-eyed peas) can be cooked separated and added. Our favorite condiment must surely be sagu gunting, chewy morsels made from either sago flour or tapioca flour that look like gems sparkling in a pool of ingredients coated with a riot of psychedelic colours. Sometimes fruits will be added, mostly pisang (bananas), occasionally nangka (jackfruit) or even cempedak, and of course whenever it is in season, durian! As mentioned above, the list of ingredients can be kept really short or runs on and on depending on one’s own liking. 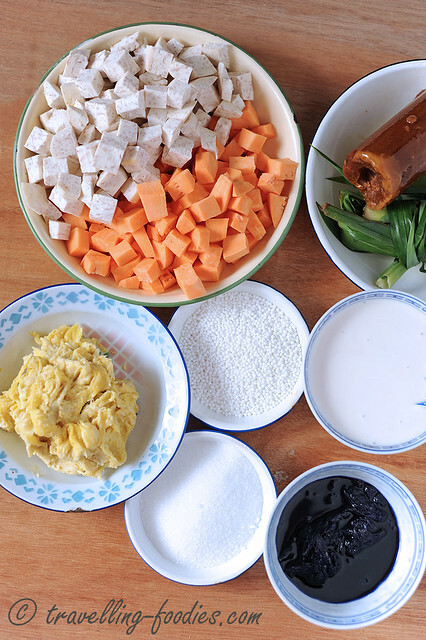 The usual culprits would be the root vegetable pairing of taro and sweet potato, sago pearls and of course coconut milk. The choice of sugar varies depending on mood. 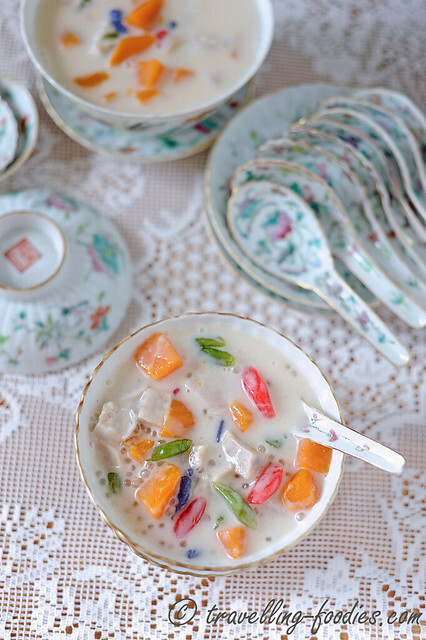 Sometimes gula melaka is added for that oomph, particularly so for the Malaccan Peranakans otherwise it would be just plain gula pasir when there are already a lot of ingredients in the sweet broth with enough sweetness on their own. Durian is our favorite fruit in our household as it is one which everyone loves to eat. Usually a portion of the pulp would be cooked into the broth while the rest is reserved to be added into the bowls just before serving for that “extra kick”! With the number of cultivars available in the market, like D10, D24, Musang King, Kim Hong etc one can choose to add one’s preferred durian variety and make adjustments to the amount of sugar accordingly, depending on how sweet or bitter the durian used is. For the durian version, my family prefers it with just white sugar and not gula melaka for the flavours of the durian to come through more prominently. There are three types of pandan leaves which are commonly used in a Peranakan household, serving different purposes. 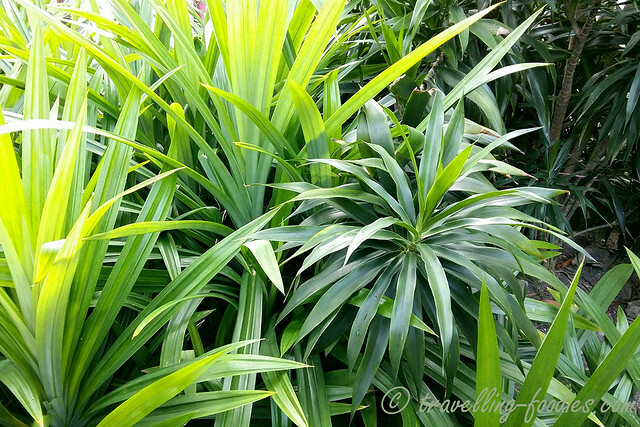 The regular pandan leaves aka daon pandan wangi (left), as the name implies is commonly used to add an aromatic dimension the dishes they are used it. The smaller leafed daon pandan serani (right), while being not fragrant at all, is used to intensify the colours of whatever kuehs they are used in, imparting their lovely emerald hues. The final one which is not shown in the photo above, taken at my dear friend Poh Lin’s house in Malacca, is daon pandan besair, which is used almost exclusively for the making of kueh chang babi. 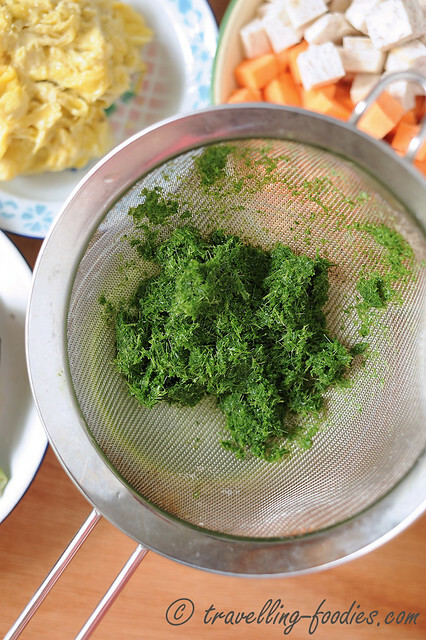 The two types of leaves, daon pandan wangi and daon pandan serani are snipped into small pieces before being blended with a little water as a natural colouring for the sagu gunting. The mixture is then strained through a fine-wired sieve and set aside for the green component to settle slightly before being used in the making of the dough. 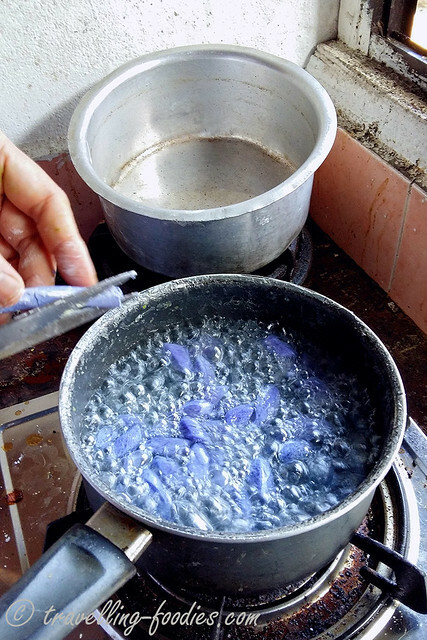 A similar process is used in the making of the sagu gunting biru, by pouring ayer bunga telang over tapioca flour upon which the two are quickly mixed until a ball of dough gathers and the sides of the metal bowl is clean. The dough is then cut into long strips and then into small gem-like morsels with a pair of scissors, and hence their name “sagu gunting“. 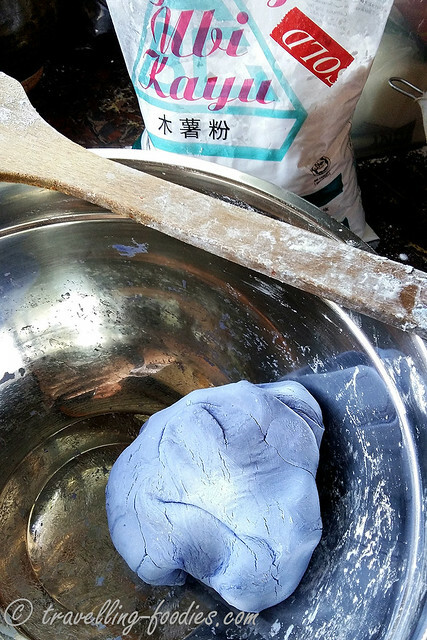 The elongated dough strips are cut diagonally (potong serong) into diamonds over a pot of boiling water. The sagu gunting is cooked when they start to float on the surface of the water which should be constantly kept in a rolling boil to prevent the tapioca diamonds from sticking to the base of the pot and with one another. There is a video of Poh Lin snipping the sagu gunting into boiling water from a dough made earlier by me. Note that fresh sagu gunting cooks really fast since the dough is technically already half cooked! 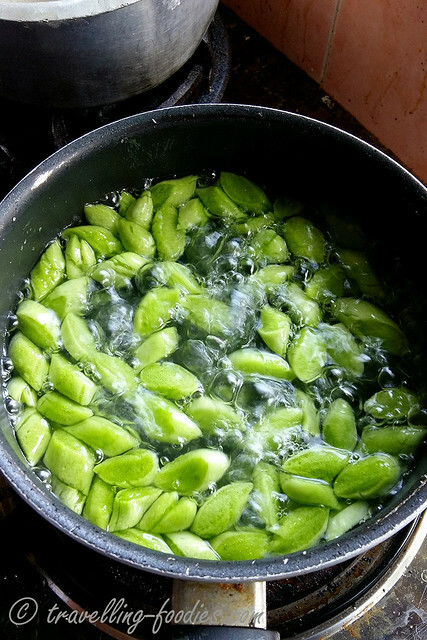 This is what the green ones using pandan leaves as a natural colouring look like while boiling, during which the dough pieces would expand slightly. Once they float onto the surface, they can be removed using a sieve or slotted spoon, and at this point, many folks would advocate plunging the sagu gunting in cold water to truncate the cooking process, but my mum did it differently. She would transfer the drained tapioca diamonds into a bowl with a bit of granulated sugar added. The residual heat and moisture from the cooked sagu gunting would help to sugar adhere onto the tapioca diamonds more effectively. At the same time, the heat also accelerates the absorption of the sugary liquids into the sagu gunting, a little trick which I’d seen her perform countless times, that goes a long way to ensure that the sagu gunting are “chukop manis” not only on the outside but also on the inside. Sagu gunting can also be made in a large batch with the uncooked dough bits placed out in the sun to dry first before being frozen. This is something my mum did, being a working mother which helped her saved time from repeating the making process whenever we crave for this chuchi mulot. The dough bits are simply snipped with a good pair of scissors and spread out over a large tray which had been generously dusted with more tepong ubi kayu or tepong sagu. When the dough bits have become sufficiently dried, harden slightly and no longer sticky or tacky to touch, they are again rolled over with more tapioca flour, before being bagged and frozen. Frozen sagu gunting do not require any thawing and could be thrown into a pot of already boiling water. It would take a slightly longer time for them to cook compared to freshly made ones but they taste just as good. The cooking process can be laborious, depending on the number of component one wishes to enjoy in his/her bubur cha cha. Then again, the steps are pretty straight forward and could be easily accomplished by anyone who yearns for a bowl of it, like me! Remember to add that extra dollop of fresh durian pulp before serving! Add the flour into a metal mixing bowl and pour about 120g of boiling water into it. Using a wooden spoon or spatula, quickly mix the boiling water and the tapioca flour until the mixture comes together into a dough ball with the sides of the mixing bowl coming clean. Adjust the consistency of the dough with either more flour or more boiling water if necessary. The final consistency of the dough should be pliable but slightly harder than our ear lobes. 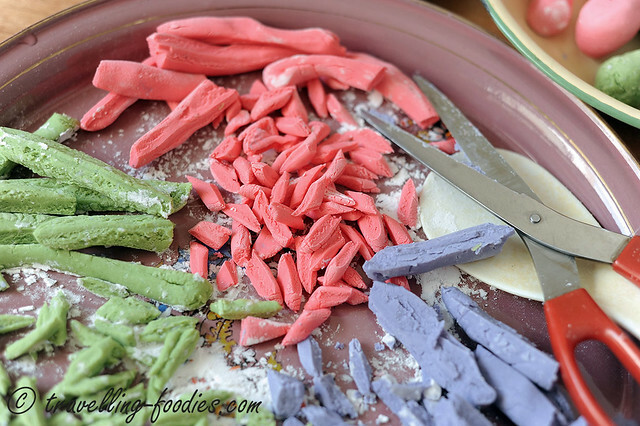 Divide the dough into 3 portions and add food colouring into them. Knead the dough balls repeated until each ball is uniformly coloured. If natural food colouring from pandan and bunga telang is used. replace the water component of the recipe with equivalent amount of juice from these ingredients, after boiling. Cut the dough balls into long strips. Roll them into cylindrical long tubes. Over a pot of boiling water, snip the dough tubes diagonally to form diamonds directly into the water. Cook the dough morsels until they float on the surface. Drain the cooked sagu gunting and pour them into a bowl with white sugar added and toss quickly with a spoon to evenly coat each piece of sagu gunting with the melted sugar. Set aside to cool down, and repeat the process with the dough portions of the other colours until done. In a saucepot, add water and bring to a boil. Add sago pearls and cook until almost transparent. Drain away most of the cooking water and pour the sago pearls into a bowl with some cooking water left. Set aside for later use. In a large cooking pot, pour in water, add the pandan leaves bundle and bring to a boil. The amount of water should be sufficient to cover all the taro and sweet potato cubes. When the water comes to a boil, add taro cubes and cook for 10 min before adding the sweet potato cubes. The latter cooks faster. Top up with more water if necessary to ensure that the taro and sweet potato cubes are always submerged in water. 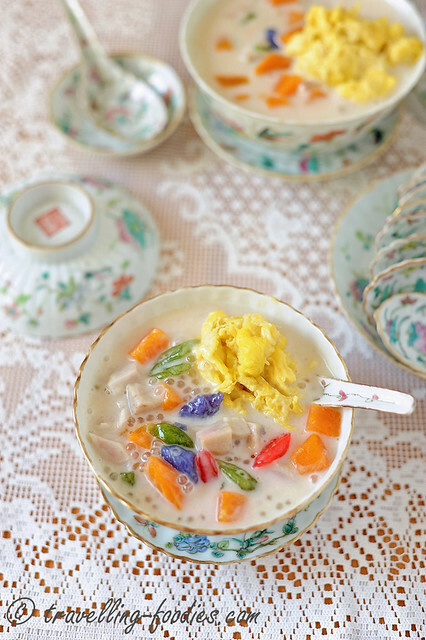 When the taro and sweet potato cubes have both nicely soften, add the cooked sago pearls, and mix evenly. Next, pour in the thick coconut milk and season amply with salt. The flame should be kept low at this point onwards and at no point should the coconut milk be allowed to boil. Pour in the sagu gunting and the soaking syrup and mix well. 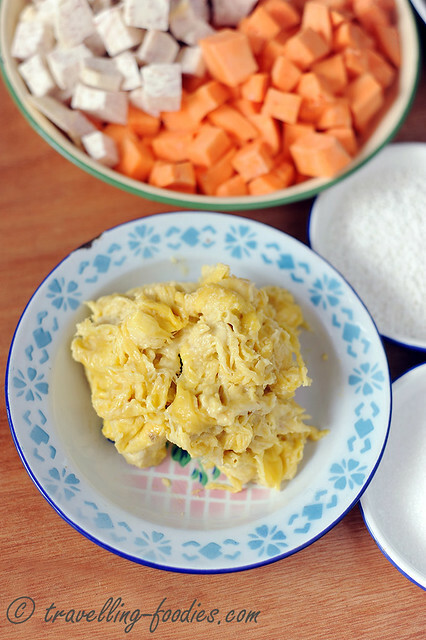 Add in half of the durian pulp, mix well and adjust the taste by adding more sugar if necessary. Cover, turn off the heat and let the mixture sit for 10 -15 min for the flavours of the durian to steep and infuse into the kuah lemak. To serve, ladle the ingredients into the serving bowls and add a generous spoonful of durian pulp by the side. This entry was posted on July 22, 2015 by Alan (travellingfoodies). It was filed under Food, Simple Eats and was tagged with bijik sagu, bubor cha cha, bubur cha cha, bunga telang, chuchi mulot, cuci mulut, daon pandan, daun pandan, dessert, durian, gula melaka, keladi, keledek, Nonya, Nyonya, nyonyaware, pandan leaves, Peranakan, sago flour, sago pearls, sagu gunting, straits chinese sweet soup, sweet potato, tapioca flour, taro, tepong sagu, tepong ubi kayu, yam.